UBC students, staff, and faculty volunteered with the Games Organizing Committee to develop and research sustainability and health promotion solutions. 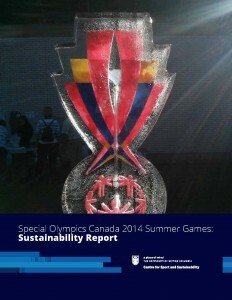 The UBC Centre for Sport and Sustainability prepared a sustainability report on behalf of the Special Olympics Canada Summer Games Society (SOCSGS) which included representation by Special Olympics Canada, Special Olympics BC, and the University of British Columbia. The Organizing Committee for the Special Olympics Canada 2014 Summer Games were recipients of the 2015 CSTA Sustainable Sport Event of the Year Award presented by the Ann Duffy Group. The award recognized the effort to deliver a regenerative 2014 Games that leave a positive long-term legacy of human and ecological wellbeing for Games participants, stakeholders, and the community. Matt Dolf, Director of UBC Special Olympics Initiatives, was the Director of the sustainability portfolio on the Games Organizing Committee. Six UBC students acted as team leads for a 60 person sustainability volunteer Games-time workforce: Grace Chang, Aliya Dossa, Serena Ng, Amani Olia, Tiago de Souza Jensen, and Kristy Tymos.